Family of Five Enjoys “Worry-Free” Camp Experience at Bissell Family Camps! Until last year, Lorissa and Corey had never taken their family camping. Raising three small children on a single income, they’d never had the time or the money to make the trip. But last year, after they were referred to the Summer Family Camps by workers in Bissell Centre’s daycare, they decided to give it a try. 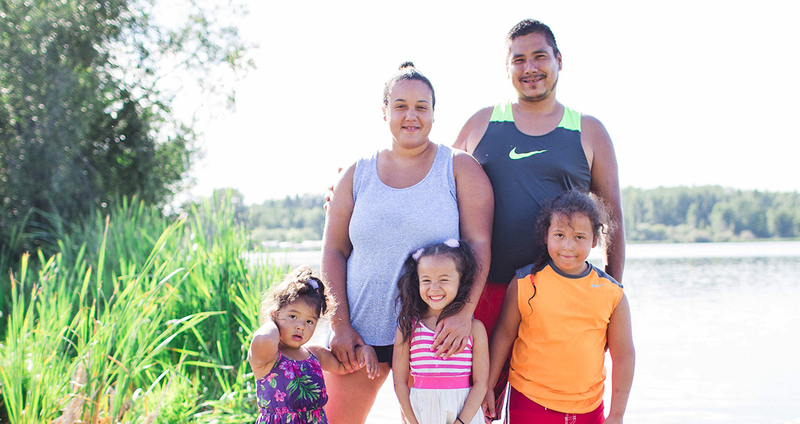 They had already been using a few of Bissell Centre’s other services, including the daycare, Family Closet and Employment Services; but it was their first time accessing the four-day family retreat offered at Bissell’s lakeside property at Moonlight Bay Centre. Lorissa and Corey with their three kids, Nehemiah, Lily and Kori, spent four days and three nights camping in the lakeside cabins. Bissell Centre volunteers took care of all the campers’ needs, including preparing all the meals and planning fun activities for the children. What Corey and Lorissa were most grateful for was relief from the stresses of everyday life while they were at camp: they enjoyed the peace and relaxation of being together without having to worry about bills or errands or groceries. Bissell Centre’s Summer Family Camps are made possible by your donations for families who are struggling. Please provide families with a life-changing camping experience this summer!